The diplomatic scandal caused by the shooting down of a Russian jet by the Turkish air force on Nov. 24 could well have derailed the French proposal to establish a united coalition against ISIS, but the signs are that there is serious enough intent to push forward with the initiative. French President François Hollande’s initiative to build up “a single, broad coalition” to ramp up the fight against Islamic State (ISIS) could have run aground after Turkish fighter jets shot down a Russian military aircraft flying close to the Turkey-Syria border. It did not happen. The restrained reaction of the major Western powers, coupled with Ankara’s toning down of its previous bellicose pronouncements, demonstrate that hopes for a new anti-ISIS alliance have not dimmed. For the record: The negotiations held by the French president in Washington with his U.S. counterpart Barack Obama this week did not fall flat, as some had predicted. The two leaders were in accord on two preconditions for engaging Russia in dealing with the challenges on Syrian territory: Firstly, Moscow must concentrate “its military action” against ISIS, and secondly, it must agree to implement a political transition in Syria. Meanwhile, interaction between Paris and Moscow on the Syrian crisis has already kicked off. In the wake of Hollande’s statement Russian chief of staff Valery Gerasimov “discussed on the phone the coordination of troops” in operations against ISIS in Syria with his French counterpart Pierre de Villiers for an hour. Certain adjustments to the mode of military operations being conducted by the Russian military in Syria are in the pipeline, establishing a completely new reality. Hollande’s call for a wider coalition was facilitated by the agreement reached by 19 regional and global players in Vienna on Oct. 30 with the final statement mapping the roadmap for a political settlement in Syria, without detailing the fate of Syrian President Bashar al-Assad. “To a degree, this does provide political cover for greater engagement between Russia and the West,” The Wall Street Journal commented last week. On the contrary, Boris Tumanov, an independent journalist specializing in France-focused studies, took a more cautious approach to Hollande's “pivot” to Russia. – So you agree with the comment of an American expert that this is just “lip service”? Nevertheless, is this not a big gamble for Hollande since he de facto bypassed NATO? The president did not even try to evoke Article 6 of the NATO Charter, stipulating a collective response in the case that one of the member states is subject to attack. According to Sergei Utkin, French society does not care much about protocol and commitments within NATO; they want solid and fast results in avenging the death of their people. 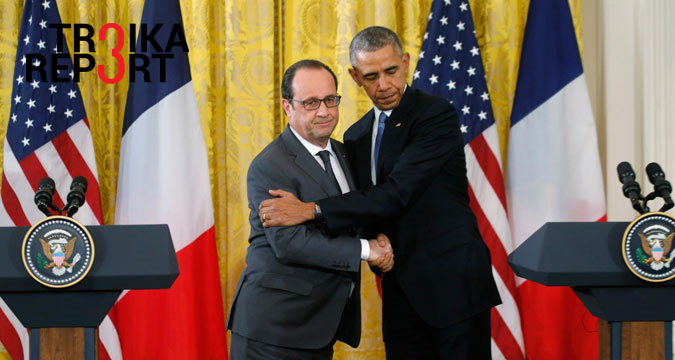 So what are the chances that Hollande’s bold move will pay off? Speaking to Troika Report, Dr. Nadia Arbatova, head of the Center of European Political Studies within the Institute of World Economy and International Relations at the Russian Academy of Sciences, preferred to focus on minor positive signs. The shooting down of the Russian jet by Turkey, which President Putin called “a stab in the back,” could well have turned into a setback for Paris’s attempt to bridge the gap between the U.S.-led and Moscow-forged coalitions battling Islamist radicals in Syria. The incident with the jet occurred at the crucial moment of truth, when the probability of a united front against ISIS had started to acquire a verifiable contour. But the Turkish air force has not downed Hollande’s vision of a grand coalition and new anti-ISIS alliance.